If you read mainstream financial media, you’ve recently seen more and more sophisticated reporting on median income trends in the United States. Instead of tossing a single median income number at you out of context, mainstream sources are getting better and better at providing context… specifically, articles are often presented with quantile breakdowns and come already adjusted for rising inflation. We wanted to do our own digging, and share how graduating college and working fulltime affects the income numbers – and you’ll like the results if you’re on that path. We’d like to advance the genre a little bit more – even though media presentations are much better, they still leave a bit to be desired. If our demographic statistics are to be trusted, most of you reading this article are college educated… attaining a Bachelor’s Degree or higher. Additionally, a plurality of you make over $100,000, with significant numbers of others making over $75,000 annually. Adding those statistics together with the fact that this site is called “Don’t Quit Your Day Job…” means I’m going to assume that most of you hold down a full time job – or, if you don’t, you work at least 40 hours per week. Seeing as college aid has mostly made a college education into a choice rather than an exception, and short of generationally bad employment markets (hello, 2009-2011!) working full-time is also mostly a choice… we felt it was fair to take a glimpse at a subset of workers: those who work 40+ hours a week, and those who attained a Bachelor’s degree or higher. Total personal incomes – including wages and all non-wage income: think Social Security, dividends, capital gains, business income, etc. Consider this article my thanks for the high achieving types who subscribe to this website – we appreciate it. We wanted you to be able to compare your earning power to your peer group. When we see statistics in the media, it’s always tempting to compare ourselves straight up to what is presented – even though by choice or by luck we find ourselves in a different demographic bucket. Resist the temptation to make those comparisons without carefully considering what is actually being measured by a statistic. So, if you count yourselves part of the “Bachelor’s Plus Full Time Job” crowd – here’s your peer group, financially exposed. We hope this sheds an interesting light on previously hidden data. 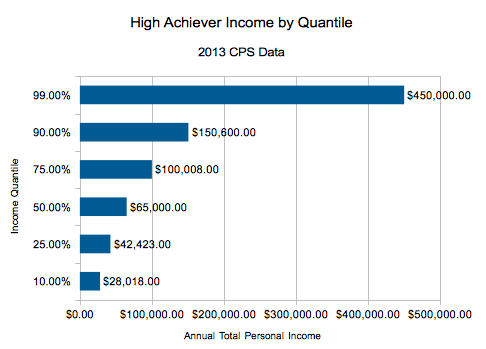 We’ll have some more deep cuts into the 2013 income data in the coming posts. This would be fascinating to see by wealth, but considering there is no real good. hard data on wealth in this country, we might be absent the most interesting view. Wealth and age can be the confounding factors or hidden variables out there, but this data confirms pretty obvious facts: working full-time is better on your income and having a bachelor’s increases your earning potential. 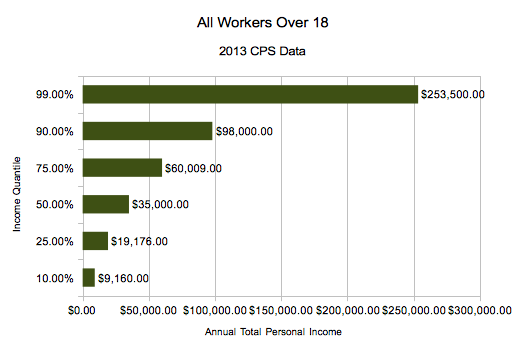 Well, you know what data I’ll be working with once I’m through with these income ones – SCF through 2013, baby. so… the takeaway from this and the previous post about okcupid is you are preparing the launch of the DQYDJ forums so we can mingle here instead? just kidding. I wonder if average “high achievers” wouldn’t rather keep comparing themselves to the rest and feel better for having achieved more, instead of feeling like losers compared to their peers. “Yes and I’d immediately have 1,000,000 intensely active forum posters”. I don’t know if I stick to one theme enough to inspire a forum, haha. I find myself to be more of a topic grazer than the average writer – skipping from topic to topic as I gain (and lose) interest, haha. Stick around for this series – I’ll take it in interesting directions as I do a few more pieces. The data is fascinating. But maybe it’s further skewed based on peer group? Mr PoP earns a fortune compared to his fellow philosophy undergrads. I, on the other hand, have a lot of fellow STEM classmates that ended up in Silicon Valley or in Stanford CT and no doubt have salaries higher at least in nominal terms to cover the absurd COLs in those areas… averaging those with the other half of my cohort that is still eeking out an existence as a post doc, and I’m guessing I’m firmly in the middle of my academic peer group. I agree with that Silicon Valley assessment – I don’t think I’d command the same salary in many other places of the country (maybe a number of the high cost geographies you mentioned, but move my job to the Midwest and I’d probably take a cut). Let me know if you have any requests – I can try to sort this in even more interesting ways.